I like to be asked thought-provoking questions. However, in our busy lives it is difficult to take time to still our minds and follow Paul’s simple instruction to Timothy, “Keep a close watch on yourself and on the teaching” (1 Tim. 4:16). Jesus also instructed his disciples, “But watch yourselves lest your hearts be weighed down” (Luke 21:34). 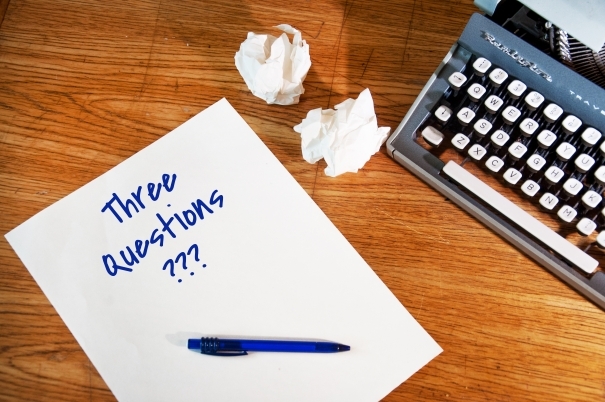 Three Questions is a series designed to put forth a few questions once a month. They can be used for personal reflection or perhaps as a way to spur on meaningful conversation in an accountability or small group. Consider the preaching or teaching you have heard in the past few weeks. Are there any areas in particular that you feel conviction from the Holy Spirit as you hear the Word exhorted? Where do you need to keep watch and ask the Lord to work change in your life today? We all need faithful accountability in our lives. As you consider your friendships, who do you have in your life that you can share your sin struggles, fears, hopes, joys, and sorrows? Do you have others in your life that will faithfully and lovingly confront you, keeping watch with you? If not, how could you prayerfully pursue accountability in the next few weeks? Is there a particular temptation that weighs heavy today? Or perhaps worldly cares that are burdensome? What are specific ways you can cast these cares upon Jesus, standing firm in your faith? Luke 21:34-36 But watch yourselves lest your hearts be weighed down with dissipation and drunkenness and cares of this life, and that day come upon you suddenly like a trap. For it will come upon all who dwell on the face of the whole earth. But stay awake at all times, praying that you may have strength to escape all these things that are going to take place, and to stand before the Son of Man. 1Peter 5:6-10 Humble yourselves, therefore, under the mighty hand of God so that at the proper time he may exalt you, casting all your anxieties on him, because he cares for you. Be sober-minded; be watchful. Your adversary the devil prowls around like a roaring lion, seeking someone to devour. Resist him, firm in your faith, knowing that the same kinds of suffering are being experienced by your brotherhood throughout the world. And after you have suffered a little while, the God of all grace, who has called you to his eternal glory in Christ, will himself restore, confirm, strengthen, and establish you. 1Tim 4:13-15 Until I come, devote yourself to the public reading of Scripture, to exhortation, to teaching. Do not neglect the gift you have, which was given you by prophecy when the council of elders laid their hands on you. Practice these things, immerse yourself in them, so that all may see your progress. Keep a close watch on yourself and on the teaching. 2 John 6-9 And this is love, that we walk according to his commandments; this is the commandment, just as you have heard from the beginning, so that you should walk in it. For many deceivers have gone out into the world, those who do not confess the coming of Jesus Christ in the flesh. Such a one is the deceiver and the antichrist. Watch yourselves, so that you may not lose what we have worked for, but may win a full reward. Everyone who goes on ahead and does not abide in the teaching of Christ, does not have God. Whoever abides in the teaching has both the Father and the Son.